◆Codream Exfoliating Wash Gloves are made of 100% thick nylon which makes it very durable. ◆The bath gloves have a textured surface to gently exfoliate your skin. ◆The exfoliating gloves look small at first but it can stretch to fit all sizes hand . ◆Promotes healthy skin and activates blood circulation and makes the skin smooth. ▲ Note: There is maybe slight color difference because of the display resolution. ▲ Our products are vacuum-packed, moisture-proof and dust-proof. Just Click "Add to Cart" button to pick Codream Exfoliating Gloves home and you will find out the amazing answer! ★ Deep Clean Your Skin -- Textured exfoliating body scrub gloves helps to renew your skin and remove all dead skin cells. Leaving your skin glowing and improve blood circulation. ★ Ease to Use and Fit Any Size Hands -- Wearing the shower gloves to enjoy a relaxing shower. Textured mitts are elasticized to stretch to fit any size hand. ★ Suitable for All Kind of Skin -- Work for dry, oily, or rough skin,you can exfoliate the neck, shoulders, feet or other areas. ★ Double Side Design -- Both sides will offer a textured, It can be used on both sides, loofah-like surface that deeply exfoliates and massages your skin. 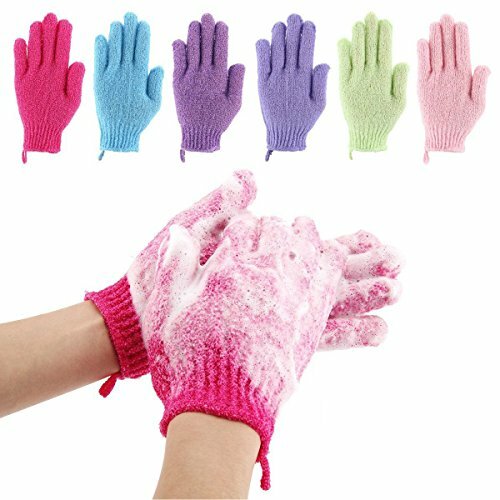 ★ As a Gift for Your Family's Member -- It Comes with 6 different colors bath gloves (Dark Purple + Light Blue + Hot Pink + Green + Light Purple + Pink) suitable for your family's member - men,women and kids.